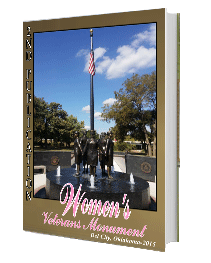 Women's Veterans Monument, the book, is dedicated to the past, present, and future service women of the United States Armed Forces. It addresses the many facets leading up to the final product, the monument itself. The Women's Veterans Monument is a representation to honor all veterans for their services and sacrifice for our freedom. This touching book was compiled, designed, and edited by Geranium Carrington for the City of Del City. Click on the cover image or here to read or print the booklet online. Click here to open a copy of the book as a .pdf file. The file will open in another window of your desktop browser. To save, choose File Save As, or File Print to print the document. The women's Veterans Monument in Del City, Oklahoma was dedicated on November 11, 2014, the project is approximately 1.5 million dollar project. It is believed to be the second largest Women's Veterans Monument in the nation. The monument depicts five slightly-larger-than-life uniformed women with an additional National Guard uniformed woman speaking with a little girl while sitting at the reflection pool. A ramp rises to a supporting structure that is higher than ground level includes water features and an extension to the reflecting pool. The centerpiece is the servicewomen in dress uniforms, facing outward holding hands, representing strength and unity between them to form a stronghold of liberty around an American flag. The servicewoman and little girl at the reflection pool represents the legacy of a future generation of service women.